John Schultz/QUAD-CITY TIMES Land for the future Bettendorf Event Center, center, along State Street, sits empty in front of the Isle of Capri casino/hotel complex on Thursday. The city is holding off issuing bonds for construction of the facility. Building plans for Bettendorf’s new downtown event center are being temporarily delayed, in part because of the Isle of Capri’s “re-analysis” of its gaming investments. City officials broke ground on the $15 million to $18 million event center on State Street in October but are holding off on issuing bonds for construction of the 50,000-square-foot facility. * The center is over budget. * The Isle of Capri is awaiting the results of a market analysis that includes its operations in both Bettendorf and Davenport. “It’s reasonable of them to take a step back,” Mayor Mike Freemire said of the Isle of Capri’s re-evaluation of development plans in Bettendorf. “Everything I’m told is that the event center is still a go. She said she expects the market analysis to offer Isle of Capri options for the Quad-Cities, including whether to relocate the Rhythm City Casino out of downtown Davenport to a location near an interstate. 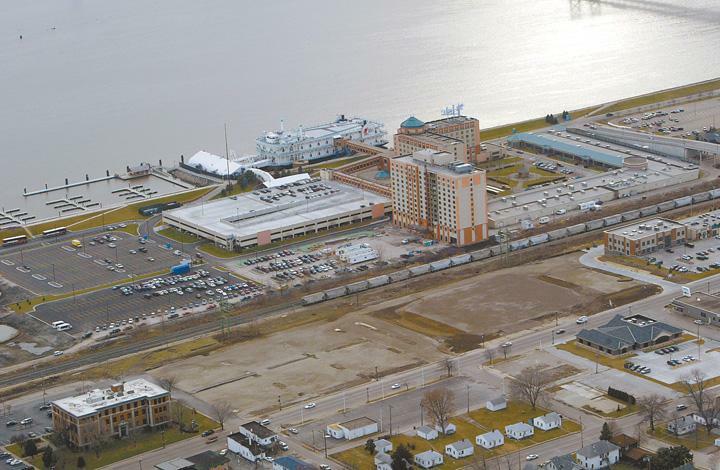 The Davenport City Council already has approved the Isle’s plan to build a new riverfront hotel and expand its gambling operation. If the plan changes, it could jeopardize the city’s chances of landing a $14 million state tourism grant. The Isle of Capri also has signed a deal with Bettendorf, which requires the city to build the event center adjacent to the new Isle hotel. The casino operator is to manage the center for 20 years, splitting profits 50/50 with the city. The agreement includes a renewal contract and relies on new taxes on the center to pay the debt on the city’s bonds. Any losses on the operation or outstanding bond debts would be absorbed by the Isle of Capri. “The taxpayer, at a minimum, is revenue neutral,” Freemire said. City Administrator Decker Ploehn said he thinks the Isle of Capri would be ready to move forward on the event center if the city was ready. “First of all, our project is over budget,” he said. “Do we cut back or find more cash? He said the event center is $2 million over budget and said the city still is in negotiations on portions of the development. Some power lines must be relocated, he said, and the city is working on getting the railroad’s approval to build a skybridge, connecting the event center and the new hotel, by running over top of the railway. Steve VanDyke, the city’s economic development director, said he is not discouraged by the Isle’s “additional analysis,” adding that progress on the event center is only slightly behind. “They’re locked in (to the event center agreement), but they’re our partners, so we want to work with them,” he said. The mayor also pointed out the Isle already has made additional investments in Bettendorf, including the new $40 million hotel, which is scheduled to open in June or July. Meanwhile, the city has hired a construction manager for the event center, and Freemire said he fully expects plans to move forward. A number of factors, including competition from a new casino in Riverside, Iowa, have been cited as contributing factors to the Isle of Capri’s declining profits in the Quad-Cities and the company’s long-term look at the market potential. Barb Ickes can be contacted at (563) 383-2316 or bickes@qctimes.com. Square footage: Originally 43,000, but recently increased to more than 50,000. Size could be reduced in budget-cutback process. Target audience: The city and Isle hope to attract business-related events beyond a 50-mile radius of the Q-C. Amenities: The event center is to be connected to the new $40 million Isle of Capri Hotel by a skybridge that would span the existing railroad.